All Aboard to a steam powered train party. 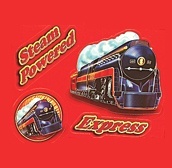 Add excitement & fun to your birthday party with our new Classic Steam Train party theme. Train partyware for more grown-up tastes and for kids who are "too big" for Thomas. Climb aboard and take a ride on the Classic Steam Train! Don't forget to check out our Cake Pans & Decor section for train cakes, cookie cutters, candles, and more.